Brian and Kristy Boase mowed their first property as MIL-SPEC Lawn Care in the spring of 2017. 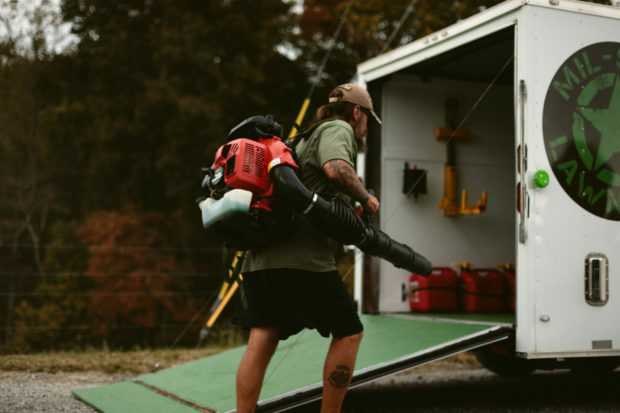 Fast forward to the fall and they were at capacity, maintaining 60 lawns a week, and giving jobs away to trusted ‘competitors’ in Clarksville, Tennessee. How did they do it? According to the co-owners, who are also husband and wife, it comes down to a technology-focused competitive edge. “I wanted to separate ourselves from the competition with our tech approach,” says Brian, about launching his business minus the old-fashioned pen and paper approach. Before he signed his first lawn, he was watching lawn care YouTube videos looking for advice, and using software to run a more efficient business came up. Brian started researching various options, settling on Jobber. He built a user-friendly website, signed up for key social media accounts, wrapped his trailer in MIL-SPEC branding (billboard on wheels! ), and him and Kristy were off to the races! Thanks to this setup, from day one MIL-SPEC was keeping electronic records, and offering their customers quick and accessible service. We got them to share specifics on how their tech approach has impacted their phenomenal growth. Instagram and Facebook were a focus for Brian and Kristy from the start. They keep their feeds active with photos of their day-to-day, giving followers an intimate look at the people behind the business—and the customers they service who they treat like family. Their social channels point to their well-designed website, with clear calls to action (make a payment, get a quote) and contact info prominently listed. From a potential customer’s perspective, all of these online elements help paint a clear picture of a friendly, reliable, and easy-to-work with business, and that was no accident. “They see our trailer and look at our marketing: they find us on Facebook or Instagram, and they go to our website, and they read our reviews, and it seals the deal,” says Kristy. In short, MIL-SPEC’s multi-channel online presence makes them easy to find, and easy to book. Step one in building out a lengthy customer list. Clipboards, printed schedules, whiteboards—these old school tools have no place in the MIL-SPEC playbook. “When we’re on the go, I probably make changes every hour in Jobber,” says Kristy about keeping an organized schedule on her phone. What does this look like in practice? In terms of customer communication, Brian and Kristy tend to keep things as digital as possible in this area as well. “A lot of our clients enjoy getting text messages from Kristy. She’s usually in the passenger seat texting away while I drive,” says Brian. They also send clients text and email reminders from Jobber for upcoming visits, all-in-all cutting down on the number of phone calls they have to make. And a bonus outcome of sticking to email and text messages are the well-documented records they become. We’ve never had an issue with ‘Well you said you were going to do this and you didn’t do that.’ We’ve never had that issue. Because all our communication—be it text message or email—leaves a digital trail. That protects both us and our clients. “As soon as Kristy leaves I tell her to send me a link to my invoice, and within 20 minutes it’s done and I get my receipt. It’s so easy,” says Lori, a very happy MIL-SPEC customer. Kristy confirms that their clients really do want to pay them, and that Jobber Payments makes it easier on everyone. 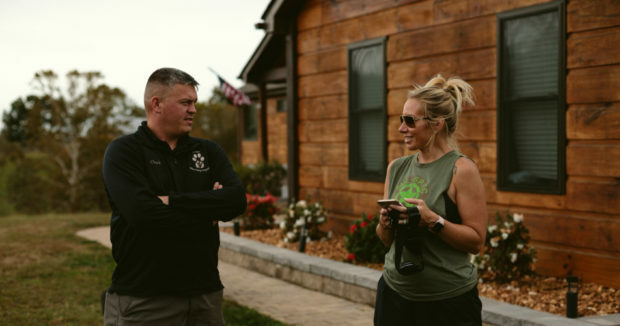 Kristy discusses upcoming work with Chuck, a MIL-SPEC Lawn Care customer. Cash left under doormat, paper invoices and checks in the mail—this has never been Brian and Kristy’s style. Kristy recalls that their last customer to pay by check was an elderly fellow who once forgot to leave payment in his mailbox. Kristy sent him an email invoice and once he checked in to ensure she actually received the money, he was happily converted to paying online. That’s a technological perk that speaks to any business owner dealing with accounts receivables. Where does MIL-SPEC grow from here? “I thought it was going to take maybe a couple seasons to build up our clientele,” says Brian, but he and Kristy don’t have any plans to bulk up their team in order to take more customers on. And with solid digital marketing strategies in place to secure those customers, paired with the right technology to retain those customers, MIL-SPEC’s goal is easily within reach.